In late winter 1940 Oslo Commerce School new building was almost completed. The intention was that the school should be used from the early autumn in 1940, but this was not to be. When attacked on 9th April the German General Staff took into the KNA Hotel, now Scandic, across the street from the new school building. So he made some own plans for the school. Photo. This white door hides dark secrets. © Travel Explorations. On April 10, Nikolaus v. Falkenhorst to Fornebo and drove from there to KNA hotel Parkveien. Straight across the street was therefore the new Handelsgymnasiet - almost fully developed - a completely modern, spacious building, very centrally located right in town. The first thought was supposed to use the building as a barracks for the German fleet, but v. Falkenhorst quickly decided that the building should be Wehrmacht headquarters in Oslo. It was struck a "deal" with Oslo Municipality that the building quickly would be finished by the original plan. Construction of the bunker in 1941, the bunker during school facility built. The bunker is built over two floors - the upper floor is the basement level. There were shelters, first aid station, changing rooms and latrines. Then there were underground bomb-proof shelters dug out. Command Central - "Der Befehlstand" - located 5.4 meters below ground and is foolproof after 2nd World War scale. Meters of concrete and steel protects the bunker. In the bunker there were telecommunications, radio transmitters, food stocks, water containers, camp beds etc. There were also filed a bunker under KNA hotel and a corridor under Parkveien tied the two bunkers along. The upper part of the bunker with the shelter etc. since the war ended has been disposed of school archives, store etc. 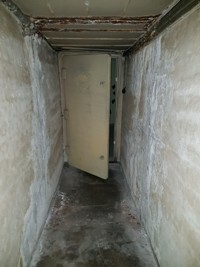 The underground bunker was a military area until 7th March 2000. Read more about the big mystery on our global travel guide Travel Explorations.